An immigrant mother holds her daughter in a Catholic Charities shelter along the U.S./Mexico border near McAllen, Texas., on Thursday, July 19, 2018. Editor’s Note: Norma and Hilda’s names have been changed for their safety. 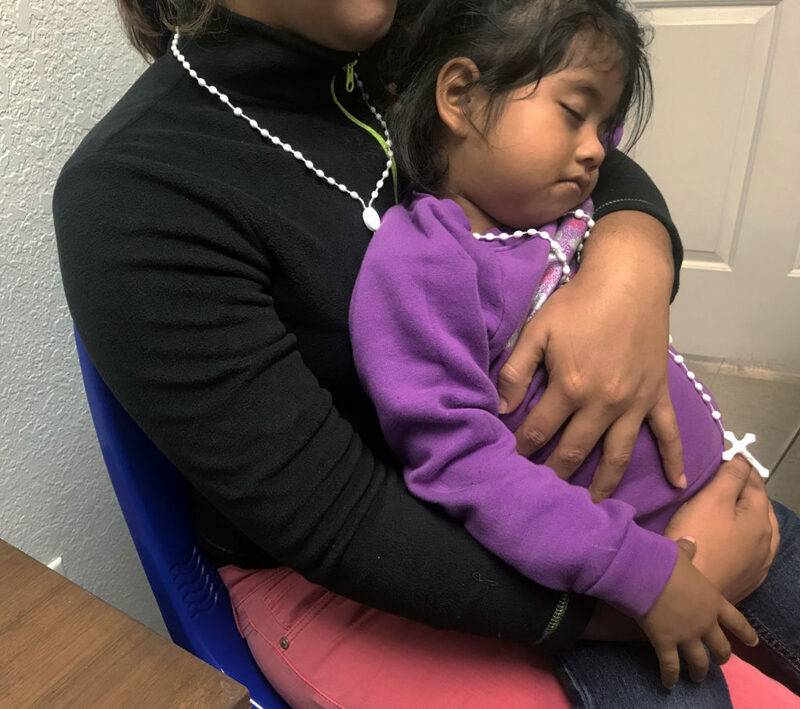 McAllen, Texas — In a chilly, windowless shelter, Norma, 21, holds her anxious 3-year-old daughter in her arms, with worn rosaries wrapped tightly around their fingers. Her 7-year-old daughter had been taken away by immigration authorities a few days earlier, leaving Norma to worry for her safety. “In the middle of the night, all you hear are children crying for their mothers,” she lamented in late June, feeling powerless to comfort her own missing daughter. This shelter run by Catholic Charities of the Rio Grande Valley is one of the first stops for migrant families who are given an immigration court date and released from detention. On a cloudy day, under pictures of Catholic saints, a few dozen families from various Central American countries sat huddled inside eagerly waiting for the buses that would eventually take them to their destination cities to face their hearings. On one side of the room, the men and boys entertained themselves watching a match of the ongoing World Cup, while mothers and young children clustered nearby. Not far away, Ursula, the Border Patrol processing center in McAllen, Texas, was filled with families and migrant children being held in cages in a cold room filled with blank stares and hush conversations. When immigrant families are caught at the southern border, they are processed here and leave after 72 hours. People had been detained during other administrations, but this is the first time thousands of kids are being separated from the parents en masse without the knowledge of when they will be reunited. The Trump administration started its zero tolerance policy in May after President Donald Trump claimed migrants are infesting the USA and bringing crime and drugs. As a result of this new policy, everyone crossing the border without paperwork is being prosecuted, including those seeking asylum. This resulted in almost 3,000 children being separated from their families. Even though the policy went into effect on May 7, international and national outcry erupted after images of children sleeping in cages and audio of children in custody wailing for their parents were made public. The administration spent weeks defending the policy, including blaming Democrats and Congress for failing to pass a law closing the “loophole” that the administration claims is forcing the separation. Immigration advocates including the American Civil Liberties Union have qualified these actions as cruel and un-American. The United Nations human rights office urged the practice be stopped immediately on June 5. After weeks of public pressure president Trump signed an executive order on June 20 reversing the policy, yet offering no substantial means or timeline of when or how the families would be reunited. While Congress struggled to address the issue, a San Diego U.S. District Court Judge Dana Sabraw on June 27 ordered federal government to reunite migrant parents with children, setting a deadline of July 10 to return about 100 children under 5, and July 26 for minors from 5 to 17 years. The first deadline was not fully met. According to the data released by the federal government, only about half of the children under 5 were reunited with their parents by July 10. The administration cited the need for background checks on parents still in custody and a few others could not be returned because their parents had already been deported. Sabraw ordered to continue with the effort of reunifying families without delay. “I think it is important to reunify now,” Sabraw said waiting on the July 26 deadline. The search for asylum on its own creates tension, and the separation aggravates the stress creating a disturbing experience for the families. Children are experiencing not only trauma but also a hard time trusting their parents once they have been reunited. The president of the American Academy of Pediatrics noted that children can suffer “irrevocable, long-term trauma” from separation from their parents. In some haunting videos and photos by national media, stone-faced children are reuniting with their parents, showing the impact of the separations. A Honduran father named Jose spoke to NBC News saying his 3-year-old son was not the same after being taken away for almost two months. In a Los Angeles Times video, a boy reunited with his father appears with a vague and expressionless stare. According to the United States Secretary of Homeland Security Kristjen Nielsen, during the Trump administration in the last five months there has been a 314 percent increase of fraudulent refugee cases found among migrants traveling with minors prior to Trump’s presidency. The percent increase represents only 46 cases of fraud out of 75,622 from October 2016 through September 2017 and 191 cases out of 31,102 in the first five months of 2018. Attorney General Jeff Sessions announced the zero-tolerance policy in April, referencing a Biblical scripture to defend the new policies. He later said the separations would serve as a deterrent to new immigrants, as did White House chief of staff John Kelly. But the Trump tactics have had the desired effect on some immigrants. Hilda, 29, who is six months pregnant, had been threatened by gangs in Guatemala and did not want to continue endangering her life or the life of her unborn child. She decided to seek asylum and make the journey to the U.S. She did not know she would encounter a zero tolerance policy that would make her regret that decision. The general reaction among many at the shelter was that if they had known of the risk of having their children taken away, they wouldn’t have crossed in the first place. As June came to an end, Norma and Hilda gathered their belongings at the shelter in McAllen . Norma carried her daughter as she and Hilda began the two-block walk toward the bus station. Hilda had an uncle waiting for her in Virginia and in three months would give birth to a U.S. citizen. Norma wondered about her upcoming court date and when she would see her 7-year-old daughter again. They both got in the bus and waved good-bye.